Snowy weather weather over the weekend has certainly made Briton feel a little more festive in the run up to Christmas, but the NHS warn that the following cold snap could be deadly. The health service has warned of an increased risk of heart attack and stroke in the days immediately after what has been nicknamed by experts the ‘snow bomb’ experienced by the country last week. They revealed the snowy weather is likely to trigger a rise in the number of people admitted to A&E. Experts say heart attacks triggered by plummeting temperatures account for two out of five unnecessary deaths from heart attacks during winter. Additionally, hospitals also usually see an increase in stroke patients around five days after a cold snap. Just under two weeks after a drop in temperature, there is a spike in respiratory admission for conditions like asthma. In recent weeks Asthma UK warned that the one in 11 UK sufferers could experience a flare up due to cold air. The cold weather affects the elderly in particular, with a 5C drop on the thermometer corresponding to a ten per cent rise in older people seeking medical attention from the NHS. This is because they may be more frail and have other existing health conditions. Experts have also warned that cranking up the heating at home by turning the thermostat on high could also be deadly. Keith Willett, the national director for acute care at NHS England, said: “Patients who have pre-existing conditions may not be aware that they are most at risk of falling ill in the days after temperatures drop. “This also adds pressure on already busy A&E departments and can be avoided by taking simple steps to keep well. “Those with pre-existing heart and lung conditions and particularly the elderly should take care to keep their homes properly heated and get their flu jabs. “We are also asking the public to keep an eye on any elderly neighbours they might have who are the most vulnerable during the winter months." 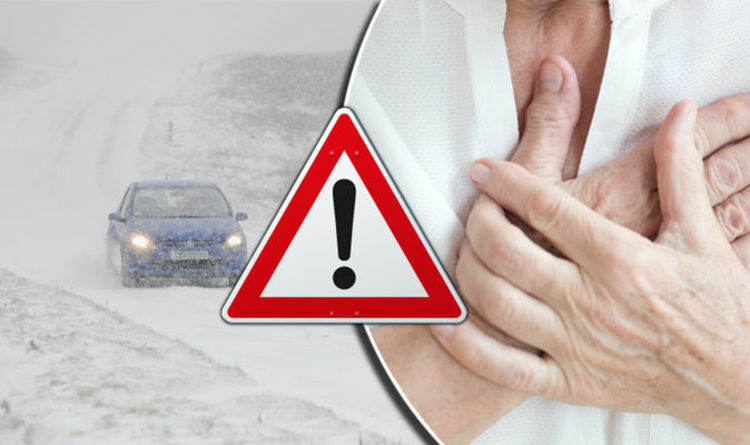 The warning comes after research published back in September linked heart failure rates to cold weather. A study by the Universitié Laval, in Québec, Canada, found that dipping temperatures could trigger the potentially-deadly condition in some people. They advised elderly people - who are at a higher risk - to avoid fog and low cloud in the winter months.